Carbon dioxide released by fossil fuel combustion makes up 57% of the greenhouse gas emissions - that includes natural and man-made greenhouse gasses. Efforts to lower that number include reducing CO2 output through energy efficiency and clean power alternatives, as well as carbon capture and storage. The former is making significant headway, but the latter is quite expensive. Both are necessary, so what can be done to make carbon capture less costly? The XPRIZE Foundation recognizes that completely eliminating man-made CO2 emissions is not practical, and since carbon is a useful element, why not convert it into something that can be sold to offset the cost of capturing it? To that end, the XPRIZE Foundation is running a competition and offering a $20M prize to the team that designs the best solution. Let's take a look at three of the competing teams. Some research scientists work in the abstract; others, like the folks at CarbonCure, deal in the concrete - literally, in this case! CarbonCure's technology takes captured CO2 and uses it as an ingredient in concrete. During the process, the carbon reacts with calcium, becoming a form of carbonate that's permanently bound to the concrete. Even if the concrete is later pulverized, the carbon will not be released. The technology is easily retrofitted into the concrete manufacturing process, so there's no retooling necessary for production facilities. And the icing on the cake: the cement is actually stronger, allowing producers to use less of it in the making of concrete. JW: In CarbonCure's process, cement is still manufactured in the same way - heating limestone at very high temperatures. Downstream at the concrete plant is where the innovation occurs. When all of the ingredients of concrete are mixing, various reactions take place. The CO2 reacts with water to form carbonate ions. The carbonate then quickly reacts with calcium ions released from the cement to rapidly form a limestone-like material, which is similar to the raw ingredient of cement, limestone. TL: I'm a little unclear about whether your process reduces the CO2 that's released by concrete production, or if it's simply adding "sequestered" CO2 to the mix. JW: This is a great question - CarbonCure's process uses CO2 that is sourced from nearby final emitters, such as refineries, fertilizer plants, or even cement plants. The emissions released by concrete production typically are not great enough to warrant the installation of a CO2-capture technology, so CO2 is sourced from larger nearby emitters that release greater quantities of CO2 to improve the economics. The CarbonCure Story from CarbonCure on Vimeo. Opus 12, founded by an innovative trio who met at Stanford University, is developing a cost-effective way to capture CO2 at its source and convert it into carbon-neutral fuels. Not only would this reduce CO2 emissions, it would also cut our dependency on foreign oil. Even better, the resulting fuel can serve as an energy storage medium, allowing renewable energy sources to become a larger part of the baseload electricity generation. You may be familiar with water hydrolysis - using electricity to split water molecules into hydrogen and oxygen. Essentially the hydrogen becomes a storage medium for energy. A fuel cell can recombine the hydrogen and oxygen to produce electricity, with water as the only byproduct. The International Space Station, whose primary power source is its solar array, uses this process, with the fuel cells acting as rechargeable batteries. TL: The process uses electricity to separate CO2 molecules. Is this similar to electrolysis for extracting hydrogen from water? How efficient is the process? NF: The electricity requirement is very similar to splitting water to make hydrogen. Modern commercial water electrolysis systems can reach 75-80% conversion efficiency. TL: Just from the standpoint of fuel production, how is this better than using electric vehicles? Is there a benefit other than range? 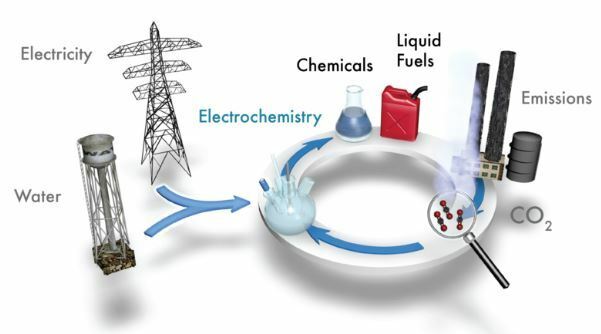 NF: Think of liquid fuels produced from our process as bottled electricity. Our fuels, which are created from recycled CO2 emissions and renewable electricity, would allow any car, truck, or plane to become an "electric vehicle" and benefit from a net zero carbon footprint. Our fuels are compatible with all existing engines, fueling stations, and pipelines. EVs are an important part of a future transportation system, but even with the most optimistic adoption rates, internal combustion engines will be around for a very long time. Our process allows you to reduce vehicle emissions without changing any fuel infrastructure. TL: If the fuel is burned in an internal combustion engine, what are the byproducts? CO2? If so, is it an even trade? NF: Synthetic fuels are cleaner burning and have lower sulfur emissions than petroleum-based fuels. The CO2 that is released from combusting the fuel in the vehicle comes from CO2 emissions captured elsewhere, resulting in an artificial carbon cycle. TL: Have you looked into the carbon footprint of the side processes, such as compressing and transporting the CO2? NF: There is no need to compress and transport CO2. Our process could bolt onto any source of industrial CO2 emissions and convert them into liquid fuels onsite. Those fuels, such as diesel, gasoline, or jet fuel, could be transported in existing pipelines or tanker truck networks. TL: The website mentions large-scale energy storage. If you convert CO2 into liquid fuel (energy storage) and then burn the liquid fuel in a generator, what's the round-trip efficiency? (I'm guessing it's low, because fuel-powered generators aren't very efficient.) How does it compare to batteries? NF: If you think of energy storage at a system level, our process can convert excess electrical power into liquid fuels, which can store that energy indefinitely. It would be most useful to use those liquid fuels for transportation. If you were seeking grid storage, it would be better to use our process to convert excess renewable power into green methane, which could drop directly into existing gas pipelines for use as heat or electricity. The current round trip efficiency would be lower than existing batteries, but the scale is practically limitless, given the capacity of natural gas infrastructure. The capital cost of this energy storage system would be significantly lower than batteries as well. As redesigned and more efficient internal combustion engines our developed, our reactors could someday be coupled with an efficient fuel-powered generator to approach the round-trip efficiency of conventional batteries. 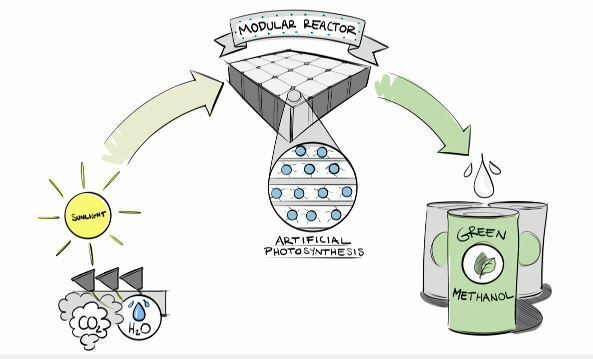 Inspired by photosynthesis, the process by which plants convert CO2 and water into usable energy, Dimensional Energy is developing an artificial photosynthesis module - a photoreactor - that converts sunlight, CO2, and water into methanol and other fuels. 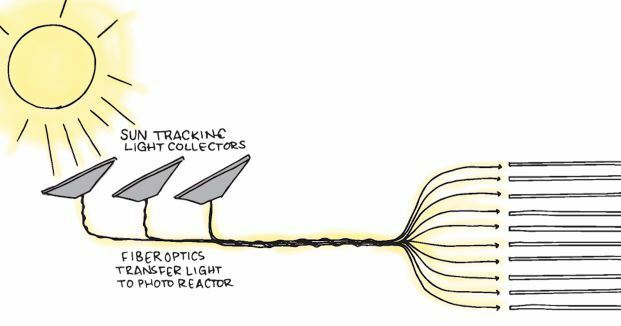 According to Dimensional Energy's team leader Jason Salfi, the researchers developed a novel fiber optic waveguide that allows the photoreactor to direct sunlight, at a desired wavelength and intensity, to a specific location. Unlike other methods of splitting molecules, this uses the sun's energy - heat and light - directly, without the inefficient conversion to electricity. The sunlight reaches a surface that's coated with a nanofluid catalyst, also developed by Dimensional Energy, which breaks the CO2 and H2O molecules' covalent bonds, allowing the component elements to form new bonds in the form of hydrocarbon fuels. A healthy competition often drives innovation; a $20M prize doesn't hurt either. Good luck, teams!